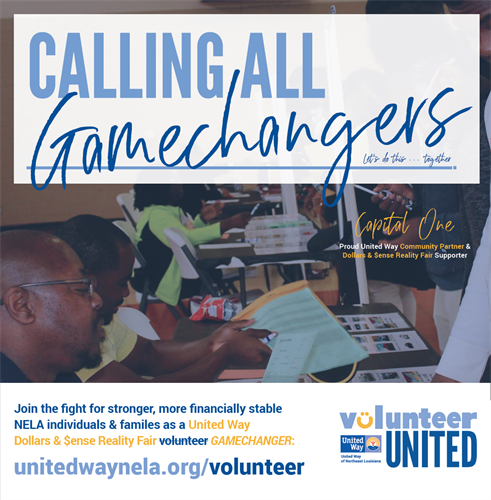 Dollars & $ense Reality Fair is United Way of Northeast Louisiana’s interactive financial education simulation during which high school students learn how to make better financial decisions and gain knowledge of budgeting, saving, and banking. This annual event for all high school sophomores in Lincoln Parish is at the Ruston Civic Center from 7:45 - 10:30 a.m: Wednesday, February 13th and Thursday, February 14th. We have 80 volunteer openings each day! To volunteer now for either or both days, click the sign up link on this page or dial 2-1-1 on any land line or mobile phone - a free call 24 hours a day, 7 days a week. Volunteers: Please plan to attend from 7:45-10:30 am on Wednesday or Thursday. If you are available for both days you will be most welcome!